Pietro [or Peter] was the eldest son of Francesco Dante and Amelia Theresa Brucciani. He was born in the year 1874 in Barga, Tuscany. His parents were the first of the family to emigrate in the year 1882 and their chosen place was Pawtucket, Rhode Island. Pietro we find in the year 1893 working as a confectioner and ice cream manufacturer from an address at 65 East Street. He was 17 years old. His brother Henry worked with his parents in the fruit business at 421 Dexter Street both addresses in Pawtucket. Both brothers were resident at a place called Ingrahamville. The year 1897 saw Pietro return home to Italy. On this trip he met up with his cousin Ermenia Quilietti again, a cousin he had not seen for some time, and the flames of love were lit. The Romance led to their marriage but not until four years later . Ermenia Quilietti at the time of her wedding to Pietro Dante in 1901 in Woonsocket, Rhode Island. 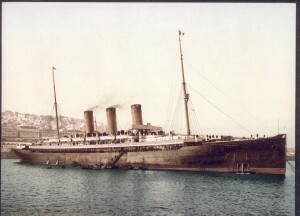 His return to America was on 8th December 1897 from the Port of Genoa on the liner Normannia. The following year the family moved to a new address at 58 Smith Street in the town. 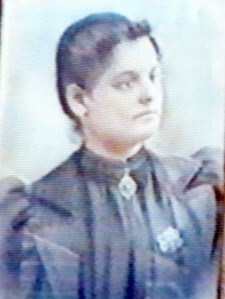 Ermenia Quilietti left Italy in the year 1901. They married in a town called Woonsocket which was just North of Pawtucket, For whatever reason Pietro had changed his profession and was working in the Cotton Mills which were dotted along the Blackstone River at the time. Slater Mill was one of the most famous of these Mills and today is a historic site. Peter’s job was a ‘Piper’ or ‘Gear Changer’ in the woollen mills. The year 1903 shows no sign of Pietro in any of the yearbooks. We know that there was a cricis back home in Italy at the time and that he may have gone home to help out. He is certainly photographed in Scotland at this time with his cousins Giuseppe Quilietti and Augusto Quilietti. The year 1905 shows Pietro back in the U.S.A. With his return we find the youngest Quilietti sister Maria Domenica and her baby Eletta Giuglietti as the latest arrivals in America. The scandal of the baby born out of wedlock was now behind Maria as Ermenia with Pietro took on the task of brining up the child as their own. In 1908 they had their first daughter Valentina born on 22nd October but she died 2 days later. Elsie was born in 1910, Alma in 1912 and their son Leonardo who was born in 1912 but again he died two weeks later. Of course the fact that Ermenia and Peitro were cousins would have almost certainly contributed to the early deaths of these two children. Elsie and Alma both however lived until they were in their 80s.